This listing is for one dozen (12) cake pops. These are baked fresh and from scratch in our commercial kitchen, using quality ingredients like King Arthur Flour, Land O'Lakes Butter. 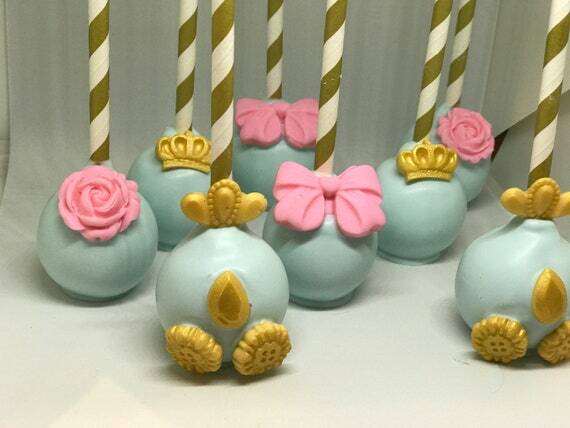 Each cake pop is hand decorated. Each cake pop comes individually wrapped in a cello bag and tied with a fabric ribbon. Each cake pop will be on a standard white stick. We do have the option to upgrade to a decorative stick, you MUST contact us to inquire about the decorative stick options. Message me if you would like the color scheme or design changed. When to place your order? Our calendar is open 5 months in advance. We ship according to your event date in order to guarantee a fresh product. Usually on Monday via USPS Priority Mail 2-day delivery. Once a week reaches its capacity it will be closed for incoming orders. Please see our shop announcements for our store availability. When you receive your items, please place them in a COOL, DRY place until your event date. If you would like a color change or other special request, it MUST be left in "notes to seller" to guarantee we will follow. Ribbon color is not guaranteed - we will do our best to match your scheme or coordinate to our discretion. Each cake pop is packaged in bubble wrap. I take extreme care in packaging your cake pops for the safest delivery possible. Although the cake pops are packaged with care, we cannot be responsible for any breakage that may occur during shipping. I do not have any control over the cake pops once they leave our hands. PLEASE DO NOT FORGET to leave your event date and number in the notes to seller. FOOD ALLERGIES: Although an allergen may not be listed in our ingredients, please note that our cake pops are made in a kitchen containing known food allergens, including, but not limited to: wheat, eggs, milk, soy, peanuts, and tree nuts.